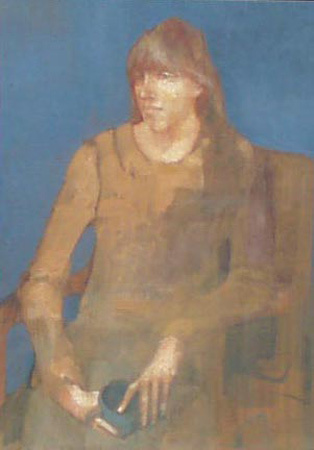 Seated Young Woman, acrylic, 33" x 24"
With roots in northern Europe, training in Germany, early artistic success in New York, and sojourns in Pennsylvania and Italy, Cornelis Ruhtenberg now lives in Des Moines and is unquestionably one of the Midwest's most creative and distinguished living artists. That her work holds broad appeal in subject matter and excellence of execution is evident by the long list of permanent collections and major museums owning it. From the Berlin Museum in Germany, to the Hirshorn and National Museum of American Art in Washington, D.C., to the Palm Springs Art Center, to the Springfield Museum of Art in Missouri, the Des Moines Art Center, Oklahoma City Museum, Denver Museum, Colorado Springs Fine Arts Center, and to the Sheldon Memorial Gallery in Lincoln, Nebraska, Ruhtenberg's paintings fascinate viewers of various ages and cultural backgrounds. Her portraits, still-life studies, and figure compositions follow a realist tradition centuries old, yet evolve beyond patterns to speak directly to contemporary viewers. These expressions offer a distinctive and uncommon harmony, elegance, and imagination. This page was first published on February 21, 2006.